Is gray finally on the way out? In 2016, Simply White and Alabaster White were the hue of the moment. Then in 2017, we saw a shift to darker neutrals, like Benjamin Moore’s Shadow, Poised Taupe and Mushroom. So what is the paint color of the year 2018? The color of the year differs from company to company but at least three big companies, Sherwin Williams, Glidden and Benjamin Moore, are going bold rather than neutral. Sherwin Williams has gone big with a rich blue with jewel-toned green, called Oceanside SW 6496. 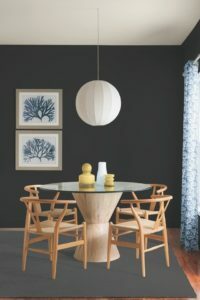 The paint company describes their paint color of the year 2018 as a complex, deep color that offers a sense of the familiar with a hint of the unknown. Oceanside promises a harmonious balance of blues and greens that can be found in what’s old and new. Sherwin Williams has a variety of home styles and decors on its website, all featuring the new Oceanside color. These photos demonstrate that Oceanside is universal when it comes to design style from mid-century modern to Mediterranean-inspired, traditional to contemporary. Sherwin Williams asserts that the color blue evokes a multitude of moods and associations depending on hue, shade and application. Despite this variety, blues are universally perceived as intelligent, honest and interesting—making blue the most beloved color worldwide. If you aren’t ready to paint an entire room in Oceanside blue, you might consider it as a lively color for a front door. 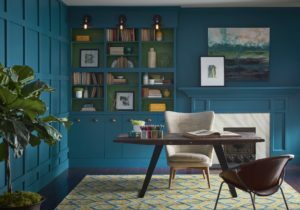 Its green-meets-blue tone can also boost creative thinking and clarity of thought in a home office, or invite meditation and introspection into a bedroom or reading nook. And if you are looking to be part of the trend but painting your walls is not an option right now, there are lots of great accessories that give you the same feeling of ocean blue. The neutral trend last year slowed last year when Shadow was chosen as Benjamin Moore’s 2017 Color of the Year. Now, Benjamin Moore has joined Sherwin Williams in choosing another bold hue. Benjamin Moore says that the paint color of the year 2018 is a bright red – Caliente AF-290. Red is incredibly versatile when used as an accent color and when it’s part of a complimentary palette. 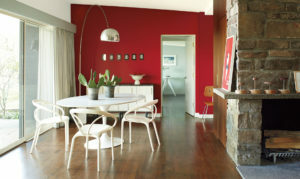 To prove it, Benjamin Moore showcased Caliente in a mid-century modern room, a farmhouse and a modern space. While gray is no longer a trending color, shades of black are making an appearance. Glidden has selected Deep Onyx as its color of the year for 2018. A black tone was also the choice for PPG Paints, which selected Black Flame (PPG1043-7) their new “it” shade. They describe it as an “unprecedented, statement-making black with deep tones of indigo.” Do you think it announces the rebirth of classic black and evokes feelings of privacy, hope and classic modernism as they do? Have you made your New Year’s resolutions for home improvement yet? Is painting a room or your whole house on that list? Remember, if you need any referrals for contractors, I have a great list. Just call me at 240-401-5577!